Thoughtful Products for the Water Treatment Industry. 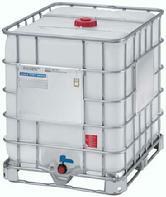 Bulk Systems, Inc. represents over 40 years experience in liquid and powder handling containers and container systems. We have found over the years that many of our customers were interested in getting containers fast so they could ship product out to their customers as quickly as possible. Therefore, the decision was made to stock a large representative stock of various types and brands of IBC's for these people. Today, Bulk Systems, Inc. has hundreds of units on hand for immediate shipment. The ECOBULK IBC is a medium duty shipping container. It uses a "blow molded" polyethylene tank inside of a tubular steel frame for stacking. This is the most popular design used in the World today and, Schutz is the inventor and originator. The Schutz ECOBULK IBC'S are made in four plants within the United States and several other plants throughout the World, including Mexico. Independent testing labs have verified the fact that the Schutz container design is, by far, the most durable on the market today. When put through drop, drag, pressure and vibration testing against any of their competition the Schutz IBC's always come out on top. Bulk Systems, Inc. has been appointed the exclusive stocking distributor for Schutz Container Systems in the Midwest and keeps an extensive stock of their containers on hand at all times. These different types are in stock for small and medium quantity releases from our warehouse. Truckload orders of 46 or more units and other models are shipped from one of the Schutz factories. amounts of product left in them. Units are in excellant condition.